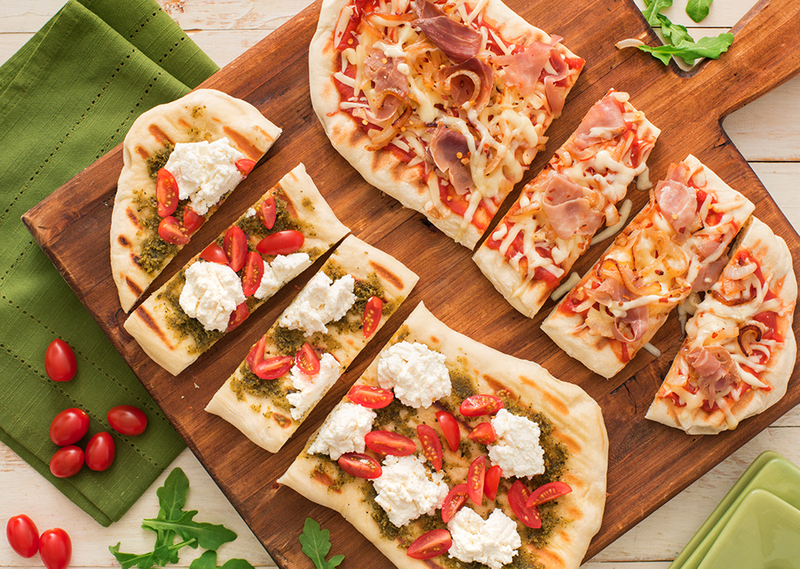 Make everyone happy with two different pizzas that are as easy to prepare as they are tasty! Preheat grill on setting #4. Divide dough in half. On a lightly floured surface, roll out each half into 12- x 6-inch rectangle, about 1/4-inch thick. Brush each piece of dough with 1 tsp of the olive oil; grill for 5 to 7 minutes or until lightly grill-marked. Flip over and brush with remaining oil; grill for 5 to 7 minutes or until cooked through. Meat Lover’s Pizza: Spread tomato sauce over one flatbread crust; sprinkle with half of the cheese. Scatter onions and prosciutto over top. Sprinkle with remaining cheese and hot pepper flakes. Grill, covered, for about 4 minutes or until cheese has melted. Vegetarian Pizza: Spread pesto over top and drop spoonfuls of ricotta over pesto. Scatter with tomatoes and top with arugula. Cut each flatbread into strips and arrange on a serving platter. Tip: The Meat Lover’s Pizza can be assembled up to 2 hours in advance and grilled right before serving.